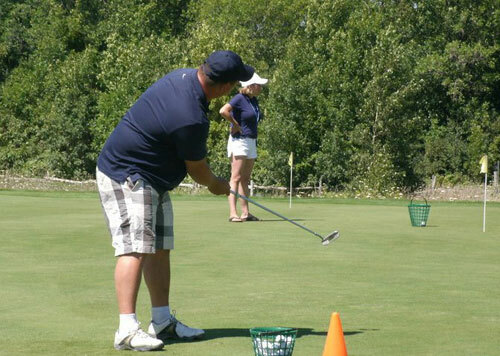 Wellington on the Lake Golf Course has various leagues that are everything from fun to competitive. Playing in a league is a great way to meet people and make sure you get out on the golf course on a regular basis. You are sure to find something that fits your needs! A Mixed League, for those that want a little competition. Play your own ball each week and you choose if you want to play 9 or 18 holes. Each week, scorecard is handed in after the round. A handicap will be established after just one round. Play continues all season. A $65 league fee covers weekly closest to the pin prizes, closing luncheon and season end net and gross prizes. Must preregister. Call Paul Farquhar 613-399-2357 for more info. Ladies Twilight Golf League This is a fun, social Ladies League which welcomes golfers of all ability, including beginners. Just show up by 5pm each Tuesday - come by yourself, with a friend or two or with a foursome and we will assign you to a starting hole. Golf starts with a 5:30pm shotgun start so we all start and finish together. Each week we play a scramble format, usually with a twist. The evenings are sponsored by local businesses owned or operated by women so a few prizes are often given out, you just have to be present to win! If the forecast calls for rain, come anyway - games will be played under the tent! Registration will be held Spring 2019, watch for details. This Ladies group gets together on Thursday mornings and play 9 holes starting at 9 am. There is a weekly signup sheet in the pro shop. The women gather about 8:30am to find out who they will play with, and in what order. Tee times are made for this 9-hole outing. This popular Friday afternoon league starts with tee times at 2pm, followed by a dinner. There is a weekly sign up sheet where you can sign up for golf &/or dinner. Foursomes are made up from the couples signed up, starting in May and running through Sept., organized by Syl Richardson and Phil Quibell.